Albert has not only worked with some of the biggest names in music but he has also maintained a solo career of his own. Albert was born on December 21, 1943 in Herefordshire, England, before moving and growing up in Blackheath, London. He was first introduced to music with the piano, taking lessons aged seven, learning the classics and pop tunes before the likes of Jerry Lee Lewis inspired him to take up guitar. Albert was treated one Christmas to a Hofner President acoustic arch-top, and from there he never looked back. Spurred on by the recordings of Jimmy Bryant, Buddy Holly and The Crickets, Gene Vincent and The Everly Brothers, Albert left school at sixteen and turned pro, getting regular gigs at the 2 i’s Coffee Bar and The Flamingo Club in London – first with Bob Xavier’s band, and then with The Jury. He replaced Jimmy Page in The Crusaders before joining Chris Farlowe and The Thunderbirds in ‘64. Albert and The Crickets in 1973 (photograph by John Livzey, courtesy Jerry Allison). He soon found his favoured guitar of choice, the Fender Telecaster, whilst everyone else was playing Gibson Les Pauls and Stratocasters. Albert admitted to feeling like the odd man out as his appreciation for American country artists grew, and he formed the band Country Fever. He began working with Poet & The One Man Band, who later turned into Heads, Hands & Feet when Jerry Donahue and Pat Donaldson (of Country Fever) were replaced by Albert and Chas Hodges. Their self-titled debut album featured the original “Country Boy”, now synonymous with Albert’s trademark picking style. The U.S eventually beckoned, and Albert began doing session work and briefly toured with The Crickets in 1973. He moved to Los Angeles, where he met his idols Phil and Don Everly, and Don invited Albert to play with him and pedal steel legend Buddy Emmons. After working on Don’s second album, Albert left to join Joe Cocker’s band and was replaced by Lindsey Buckingham. Albert with the Hot Band, 1976 (courtesy the Lee family). Albert’s reputation was growing as he moved to Encino, and met his wife Karen whilst rehearsing up in Santa Barbara with Joe Cocker and his band before they went on the road. He contributed to Cocker’s “Sting Ray”, and was then approached by A&M about putting together a solo album. At a pivotal point in his career, Albert was asked by Emmylou Harris to replace James Burton – one of his guitar heroes – who was leaving for Elvis Presley’s band. In 1976 he joined the Hot Band, and his incredible guitar work came to the fore on the “Luxury Liner” LP. 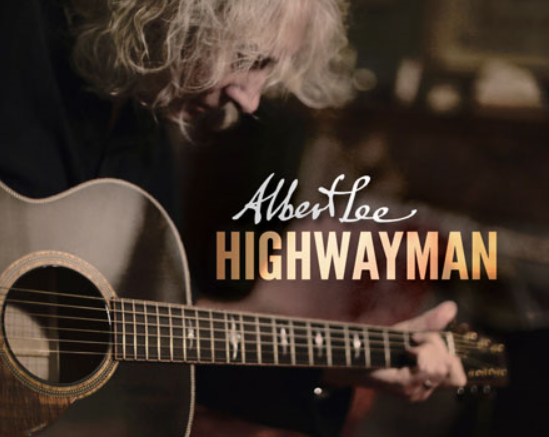 Albert released his first solo album “Hiding”, produced by Brian Ahern, which featured perhaps the definite version of “Country Boy” with Emmylou on backing vocals and Ricky Skaggs on fiddle. When he returned to London in 1978 for session recording, Albert met Eric Clapton. He was invited to join his band and played on Clapton’s live album “Just One Night”, which featured Albert on lead vocals for a cover of Mark Knopfler’s “Setting Me Up”. Albert would work with Eric for five years before he left and released his second solo album, the self-titled “Albert Lee” in 1982. Albert fulfilled his boyhood dream to play with the Everly Brothers in 1983 when he acted as guitarist and musical director for their reunion concert at the Royal Albert Hall. Since then he would regularly tour with the Everlys on and off for 20 years. After two instrumental albums – “Speechless” (1986) and “Gagged But Not Bound” (1987) – steel player Gerry Hogan invited Albert to headline at a festival in Newbury, England – fronting his own band for the very first time, Hogan’s Heroes. Eric and Albert in Yugoslavia, late 1979 (courtesy the Lee family). As Albert toured with Hogan’s Heroes through the late 80s, he began his long association with Ernie Ball Music Man, who would eventually (through many iterations) produce his signature guitar that he tours and records with today. In 2002 he would join Eric Clapton, Tom Petty, Paul McCartney and other music legends on stage at the Concert for George at the Royal Albert Hall. Albert also recieved a Grammy Award in 2002 for his contribution to “Foggy Mountain Breakdown” featured on “Earl Scruggs and Friends”. He appeared for the first time at Clapton’s Crossroads Guitar Festival in 2007, now an annual appearance, and has toured periodically for the last few years with ex-Stones bassist Bill Wyman’s Rhythm Kings, performing with Georgie Fame. Joining his hero James Burton, along with the likes of Vince Gill and John Jorgenson, Albert won a Grammy for his performance on Brad Paisley’s instrumental “Cluster Pluck” in 2009.